Dr Naomi Paxton is a performer, writer and researcher. Naomi trained as a perfomer at Goldsmiths College, University of London, and the Royal Scottish Academy of Music and Drama (now the Royal Conservatoire of Scotland). After ten years as a professional actor, she started a PhD. Her doctoral research at the University of Manchester explored the work of the Actresses' Franchise League and the contribution of theatre professionals to the suffrage campaign. In 2013 she edited The Methuen Drama Book of Suffrage Plays (Bloomsbury) which launched at a Platform event at the National Theatre entitled Suffragettes on Stage. Other publications include Stage Rights! The Actresses' Franchise League, Activism and Politics 1908-1958 (Manchester University Press, 2018) and a second edited collection, The Methuen Drama Book of Suffrage Plays: Taking the Stage (Bloomsbury, 2018). A confident, engaging and creative public speaker, Naomi was one of the AHRC/BBC Radio 3 New Generation Thinkers for 2014-15. Her extensive public engagement experience includes regular appearances on BBC radio and television, and talks at the National Theatre, Bristol Old Vic, the Barbican, the National Archives, the Hay Festival and Latitude Festival, amongst others. Naomi is currently Knowledge Exchange Fellow at the Royal Central School of Speech and Drama, University of London. ​She is also Associate Fellow of the School of Advanced Study, University of London, and an Associate Artist of feminist production hub Scary Little Girls. She worked in Parliament from 2017-18 on an AHRC funded project entitled What Difference Did the War Make? World War One and Votes for Women and was nominated for a Parliamentary Diversity and Inclusion Award for her work with the Vote 100 team. Naomi is the curator of Dramatic Progress, an exhibition at the National Theatre from October 2018-January 2019. She performs at comedy, cabaret and variety nights as her character Ada Campe. Ada won the prestigious New Act of the Year Show (NATYS) in 2018, and the 2018 Old Comedian of the Year competition. Naomi has contributed to two recent books about women in comedy, The What the Frock! Book of Funny Women (2015) and Stand Up & Sock It To Them Sister (2016). Naomi completed her doctoral thesis: Re-evaluating the Actresses Franchise League: actresses, politics and activism from 1908-1958 in the Drama Department of the University of Manchester in 2015. Her supervisor was Professor Maggie B. Gale. As well as MC-ing nights like Museums Showoff and the V&A Museum's Carry on Curating as herself, Naomi performs professionally as her comedy character ‘Ada Campe’ at comedy, variety and cabaret nights. Ada Campe won the prestigious New Act of the Year show (NATYS) in 2018 and the 2018 Old Comedian of the Year competition. Naomi trained in Acting at the Royal Scottish Academy of Music and Drama (now the Royal Conservatoire of Scotland). She has been working professionally as an actor since 1999 and has appeared in the West End and on tour in the UK and Internationally. ​In October 2018 Naomi joined the Royal Central School of Speech and Drama, University of London as Knowledge Exchange Fellow. ​From April 2017-April 2018 Naomi was the Research Assistant at Parliament on a joint AHRC funded project between Professor Krista Cowman at the University of Lincoln, Dr Angela Smith at the University of Plymouth, and UK Parliament Vote 100. What difference did the war make? World War One and Votes for Women featured public events and workshops in Plymouth, Lincoln and London, and in January 2018 Naomi created an exhibition o Parliament to celebrate the centenary of the granting of the limited franchise to women. From February-June 2016, Naomi was Cultural Engagement Fellow at the School of Advanced Study, University of London. From September to November 2016, Naomi returned to SAS as the co-curator of London Hub 'Ministry of Hope and Fear' and London Hub Convenor for the Being Human Festival. From 2015-2016 Naomi was the Post Doctoral Research Associate for Poor Theatres, ​an AHRC funded project at the University of Manchester. 2017-18 V&A/RCA, MA History of Design – Performance, Guest Lecturer for ‘Class, Culture & Hierachies’. 2017-18 School of Advanced Study, University of London. Workshop Leader ‘Impact and Public Engagement’. 2018 University of Manchester, Visiting Lecturer, BA Drama: Gender and Sexuality on the Twentieth Century British Stage. 2017 University of Manchester, Visiting Practitioner, BA Drama: Performance Practices 2. 2013-16 University of Manchester, Visiting Lecturer, BA Drama: Texts in Rehearsal/Texts in Performance. 2013-16 University of Manchester, Teaching Assistant, BA Drama: Performance Practices 2. 2012-14 University of Manchester, Teaching Assistant, BA Drama: Performance Practices 1. Naomi was the first Actor in Residence at Christ's Hospital School, West Sussex in 2002. ​She then spent five consecutive summers in Romania working in state run orphanages for special needs adolescents and developed a drama workshop programme that used puppetry to facilitate communication and creative work with non-speaking, autistic spectrum participants. ​Naomi is an excellent communicator with highly developed creative, production and curatorial skills. She has production management experience, and has worked in London's West End on over 30 plays, musicals, operas and events both front and back of house, predominantly in Wardrobe and in Box Office. 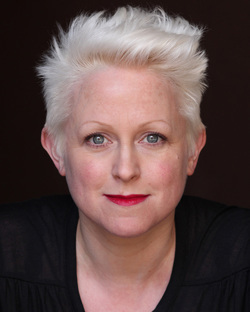 Naomi produced Knickerbocker Glories, a triple bill of Suffrage plays that ran at the Union Theatre in London in June 2010, and has co-produced three Living Literature Walks with feminist production hub Scary Little Girls: Stage Rights! A Living Literature Walk (April 2013 and May 2016); A Particular Theatre: Shakespeare, Suffragists and Soldiers (November 2016); and Women and War: the West End and the Western Front (November 2017). In 2018 Naomi was commissioned to create a special interactive performance for the launch of the University of London's Leading Women programme. She also devised another interactive performance for the Senate House Open House London in 2018. In 2018 Naomi curated an exhibition about women and WW1 as part of the UK Parliament Vote 100 project.